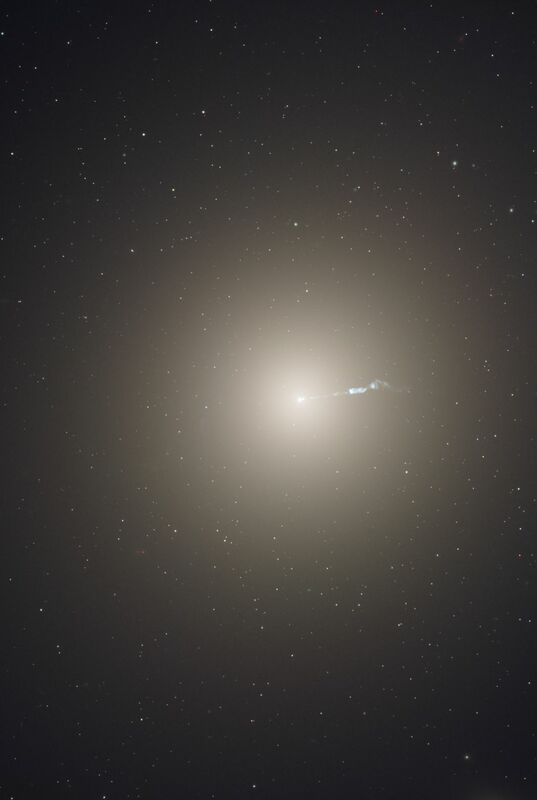 The monstrous elliptical galaxy M87 is the home of several trillion stars, a supermassive black hole, and a family of 15,000 globular star clusters. M87 is the dominant galaxy at the center of the neighboring Virgo cluster of galaxies, which contains some 2,000 galaxies. Amid the smooth, yellow population of older stars, the two features that stand out most in this Hubble Space Telescope image of M87 are its soft blue jet and the myriad of starlike globular clusters scattered throughout the image. The jet is a black-hole-powered stream of material that is being ejected from the core of the galaxy. As gaseous material from the center of the galaxy accretes onto the black hole, the resultant energy released produces a fire-hose stream of subatomic particles that are accelerated to velocities near the speed of light. Being in the center of the Virgo cluster of galaxies, M87 may have accumulated some of its globular clusters by gravitationally pulling them from nearby dwarf galaxies that seem to be devoid of globulars today. The 120,000-light-year-diameter galaxy lies at a distance of 54 million light-years from the Sun in the spring constellation Virgo. This image was made from Hubble's Advanced Camera for Surveys. 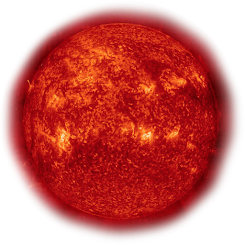 The image is a composite of individual filtered data that cover the visible and infrared portions of the spectrum.